Last Sunday I ran my first ever 10k race. The good news to this is that whatever time I ran would be a PB! The not so good news was that I did not really read the small print before signing up. 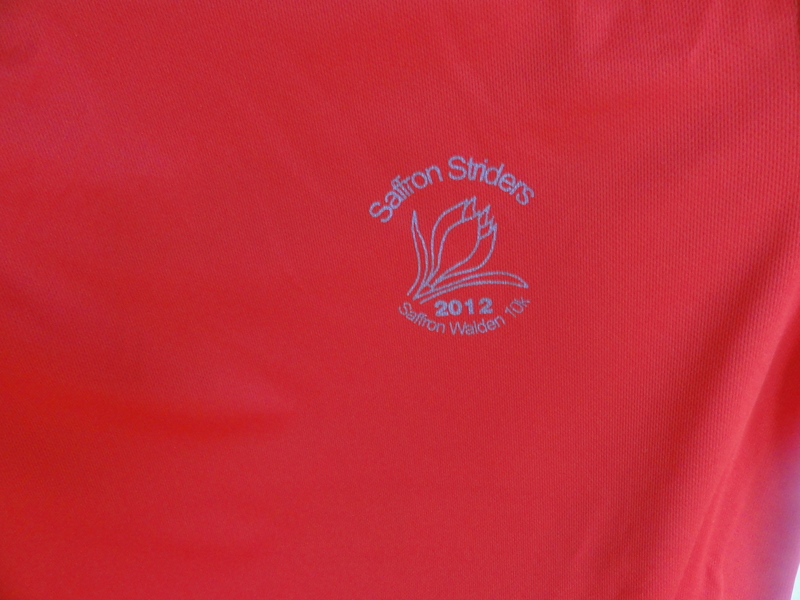 I trusted my friend who said their were a ‘couple ‘ of hills but you get a free t-shirt. Sounded good to me. However, when we arrived and I read the posters properly it said that it is a ‘challenging course’! Hmmm. I did, however know that it was a trail run (90%) so didn’t expect a quick time. The start was well sign-posted and we went down, having registered easily with plenty of time to spare. There are no chips provided in this race but I had my trusty Garmin with me. I don’t know about you but I really hate the first mile or so until everyone spreads out a bit. It is just so stressful having people all around you, pulling out in front without any warning and having to get around those running slower than you. We immediately set off up a hill, off the road from the start. The track was one of those with two wheel tracks and the uneven middle. This restricted the amount of movement you could do easily to dodge other people. The wind was also a factor during this race as it was quite strong and took my breath away at times. The first part of the course was there and back which was a bit disconcerting when I first realised this. It is always hard running when you can see all the runners that are ahead of you. Of course it is easier when the tables are turned. I also liked the fact that there were a lot of hills at the start but on the way back there were fewer and it felt as if you were running downhill more of the time. That is to say until mile 5 (ish) when they somehow managed to import a mountain to the Essex countryside! I kid you not. I think nearly everyone walked for a bit up that hill. It was probably quicker than running it. The only main negative that I can think of is that there were parts of the course that were totally single file with no room at all for manoeuver. I didn’t have a particular problem except that (and here comes my excuse) I had a bit of an asthma attack and did not have my inhaler. As we got further around I found it harder going as my lungs closed up and was a bit conscious that I may well be holding those behind me up. Not a feeling I liked very much. 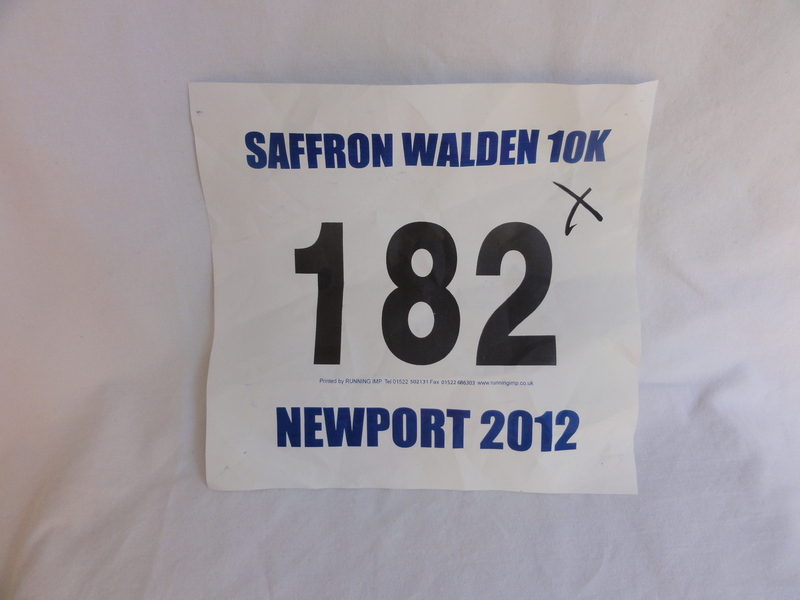 My number – the cross shows that I had collected my t-shirt, not that I was disqualified! Did you run this race, or have you run any recently? What were your experiences? I made the mistake of signing up for a 10k race the day before with no idea what the course was like – on the day it was 5km up and 5km back down….. it was awful, last time I’ve ever done something on impulse without doing a bit of research first! Well done for finishing though and an amazing time considering the hills! Yep – research is good but sometimes the unknown is better!! Thank you for the compliment.